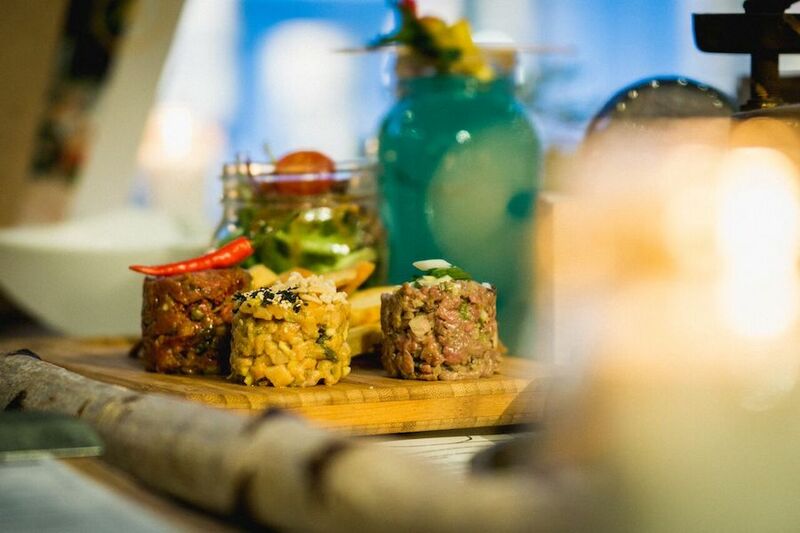 There’s always a great deal of excitement generated when a new restaurant opens in Montreal. Curious foodies, bloggers, media, social scene-stealers and nightlife lovers flock to be among the first to try new food, sit in a swanky new space and own the right to say “I found this great new place you have to try”. 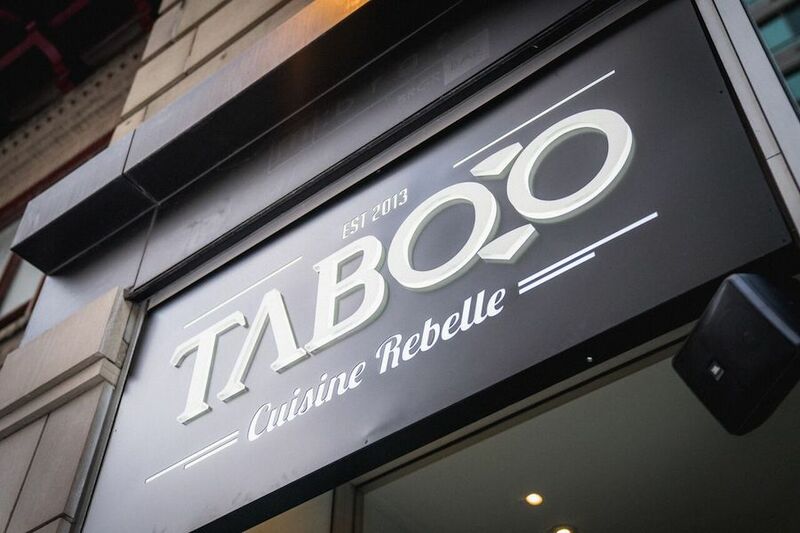 A few weeks ago Taboo Cuisine Rebelle opened its doors in the same space where the once popular M:BRGR held court when Montreal’s gourmet burger trend was at its peak. This past week I returned to the restaurant with Caroline from the Everyday Luxury and Veronique from La Journaliste to try the food in a setting that resembled a normal night at the restaurant. 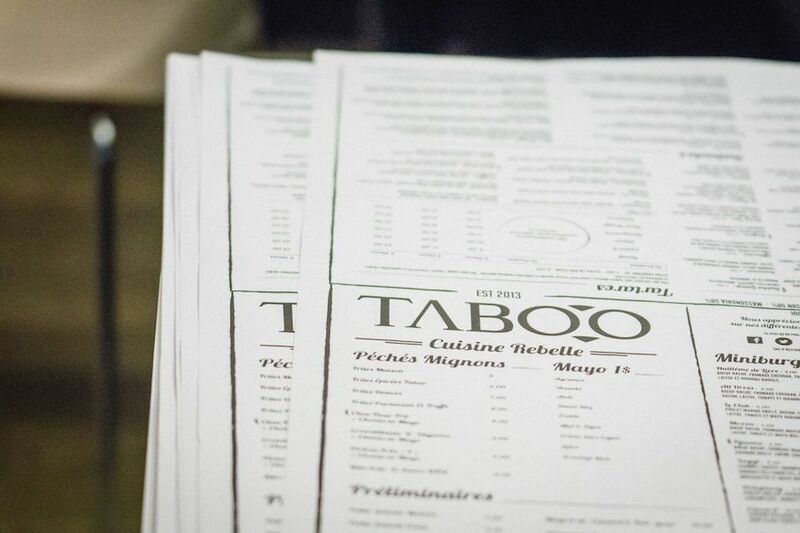 Taboo has existed for a number of years, off-island in the city of L’Assomption, and the owners have been successful enough to build up their reputation and good-will capital to try their hand at Montreal’s competitive restaurant scene. 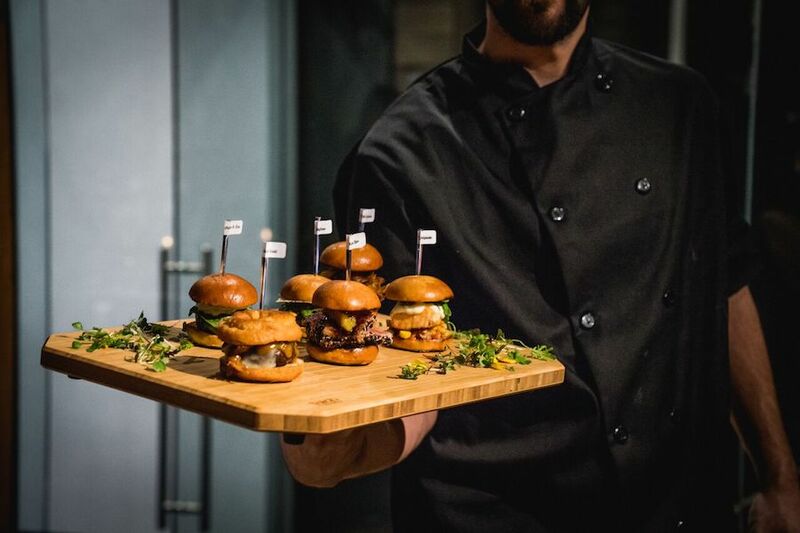 They serve a massive selection of sliders filled with various meats, fowl and fish and all that is accompanied by several tartares, fries, poutine, onion rings, salads and more. Opening a restaurant in Montreal takes courage, patience and a thick skin and these guys should be commended for that. There’s no telling how Montrealers, who have seen and tasted it all, will react to any new restaurant and opening yourself to criticism or success is harder than it may seem. I remember the gourmet burger trend that hit the city by storm about 10 years ago. While that trend has largely plateaued, we still find the scattered restaurant putting crazy ingredients between two pieces of bread in hopes of creating buzz-worthy word of mouth customer awareness. While in my opinion burgers are forever, and they will always have their place, we are no longer in a place where people in Montreal will go out of their way for a fancy burger-related gimmick. If you’re going to make a burger, make it good, make it simple, use quality ingredients and it will stand on its own. Taboo is an ambitious project that hopes to reel people in and sell them numerous combinations of something familiar – something we’ve already seen (and charge them a pretty penny for it). The food has its high points. The seasoned fries and battered onion rings are actually amazing, the beef and salmon tartare are fantastic (some of the best and freshest I have ever tasted). 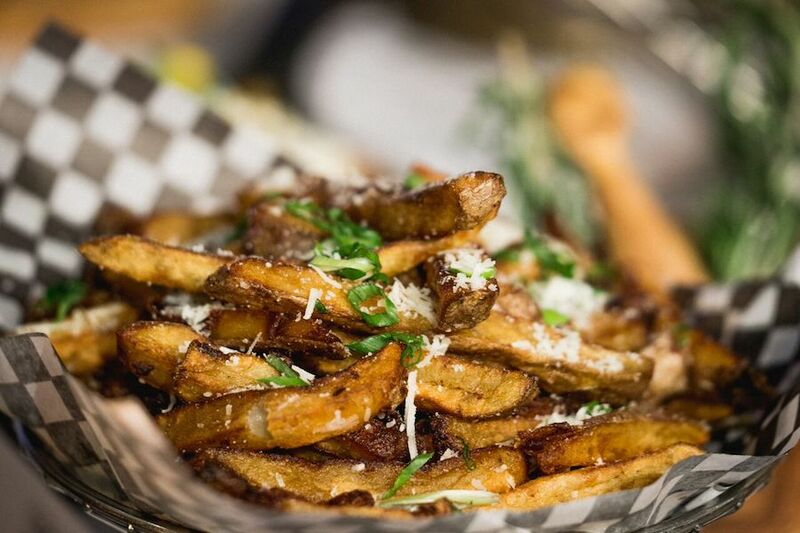 French fries can easily be dismissed as a simple side dish, but dressing them up with rosemary, parmesan, pepper and more is inventive and fresh. The sliders, the restaurant’s MO, are prepared with varying degrees of taste and matching degrees of success. I don’t know how much of the food is prepared before hand but if you’re charging $4-$13 for a mini burger, it sure as hell better be worth it. The sliders were the most disappointing part of our meal. Some of the meat was too dry and some of the burgers didn’t have enough sauce. We were given six of their greatest hits to try and out of the six, none were that memorable. I get using ground beef, the ground bison, the pulled pork and even the Greek chicken but then there are ribs, salmon, shrimp and more and I don’t know how putting these things between two buns makes them better or even different. As good as some of the food is, it isn’t anything we haven’t already been presented in one form or another. There’s also so much happening on the menu that it’s intimidating. 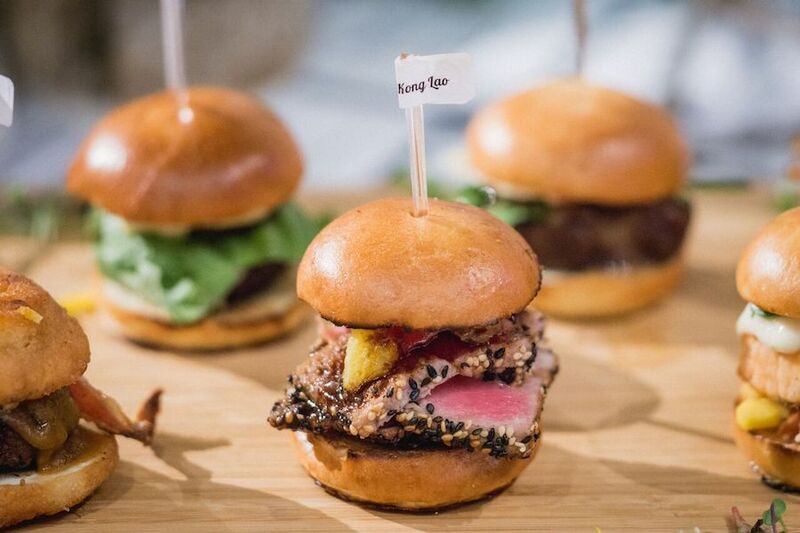 They boast having 45 different mini burgers, 17 different poutines and 180 different combinations of tartare. Impressing with quantity seems to be their top priority. The menu sits on the table as a paper placemat and takes up the entire surface. If you are going to open a comfort food restaurant in the city, maybe tightening the focus to a select number of items and refining them to a tee. Some special edition items or weekly additions could be added to have people return for more. But at Taboo their skirt is up and all the goods are on display. It would have been wonderful to take what they’ve learned from operating a restaurant the past and paid attention to Montreal’s current trends to push the comfort food envelope to the next level. Potential here is squandered. The service at Taboo is standard but above average; the wait staff is knowledgeable, very friendly and the patrons are treated with respect. I noticed this as the waiters paid dedicated attention to their various tables. The restaurant’s décor, like its concept, feels more 2008 than 2018. While bright and inviting, there are a hodgepodge of elements, like the wall art and the fake ripped wall coverings (revealing “construction wiring” underneath) that they took a bit too far. I’ve never been to the Taboo in L’Assomption but I can guess that if they hope to franchise the decor must look similar. Taboo has thrown at lot at the wall but will any of it stick? Only time will tell. I have seen better and worse restaurants in the same range close not long after they’ve opened because they don’t bring anything new to the table. Although I wish them all the success in the world, I think they’d have been better off asking themselves if they should open a Taboo in Montreal instead of acting on the knowledge that they could.